This is crazy friggin' good! I love cheesecake. Love it. 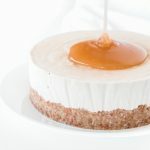 A couple of years ago there was a local company that made dairy-free cashew cheesecakes that were amazing. Amazing. I've been meaning to try making paleo/vegan cheesecakes ever since trying them, and finally, I got on it. Even I am surprised at how good this recipe turned out (I'm not a dessert wizard, so this was a fun adventure). You should see the ridiculously long list of potential flavors that I came up with. But why start with anything but my dessert fave: salted caramel. If anyone tells you salted caramel isn't the best, they're wrong. Tell them I said so. I don't know how I've resisted eating the whole thing today. I've been here editing the photos, typing the recipe, and generally thinking about it in my mouth, and there's nobody here to stop me… Torture. Someone get over here and eat some of this. Save me from myself! 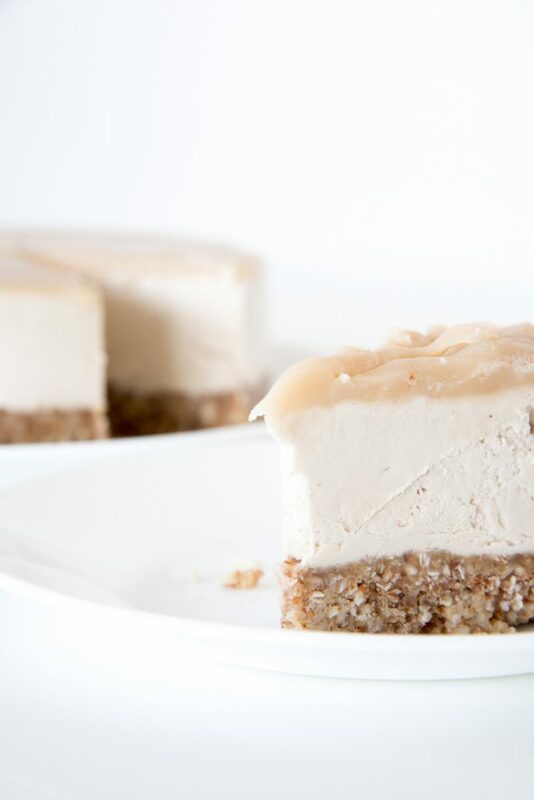 A friend tried this raw salted caramel cheesecake and told me that it was better than the cheezecakes made at a local vegan restaurant. Yeah baby! Don't forget to make a dozen long-stem Strawberry Bacon Roses for your Valentine! Happy Valentine's Day my lovelies! Note: You'll probably have a little extra salted caramel – perfect for licking off your lover this Valentine's day. You're welcome. Place all crust ingredients in a food processor and work it baby! Er, process it until it's a course gravely texture. If frozen, allow the whole thing thaw out before serving and refrigerate any remaining servings – if that's a thing. This looks delicious! I’ve been eating paleo since 2019 began and just recently started craving something sweet. to my understanding, sugar is sugar. This is why i’ve avoided all things maple syrup. but I guess like all things, moderation is key. I may have to give this a try. It doesn’t seem overly complicated. Since the sweetest thing to pass through my lips is an apple or banana, i’m sure it’s heaven! It depends on what perspective you’re speaking when you say sugar is sugar. From a ketogenic diet perspective when you’re trying to maintain a ketogenic state, yes. But from a general health perspective, not all sugars are created equal. There are differences in glycemic index and resulting insulin responses, for example. Fruit, starches, white sugar, white bread, real maple syrup… they’re not the same. But when you’re breaking up with sugar, like it sounds like you were Whole 30 for January? then avoiding all major sources can be helpful in breaking that addiction, imho. In general, though, I would agree that moderation is a healthy strategy. As for this, it’s not too sweet (I have a fairly low tolerance for sweet, though the addition of salt raises that tolerance a bit), but there is a little room to reduce the amount of maple syrup in this recipe if you so choose. I have got to make this recipe soon!! Omg yum! 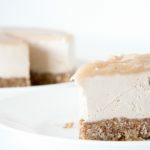 I’ve actually been wanting to make a cashew cheesecake! This caramel sauce looks bomb! Cheesecake is my biggest weakness and this one looks so incredible! I’m just drooling at the photos. Can’t wait to try this! Not only are these gorgeous, but they look super tasty. Can’t wait to try! Thanks Kelly! Let me know what your mouth thinks. Well holy moly this looks amazing! creamy, silky, and oh so yummy! a DESSERT to be on REPEAT!! This looks gorgeous, easy to make and so delicious. and how can you not like salted caramel anything? That’s pretty much how I feel about salted caramel too. Wow! I can’t believe this is vegan AND paleo? It looks incredible! Great use of cashews to achieve that texture. This is a must-try! Thanks Irena. Question for you: is “eatdrinkpaleo.com” yours as well as “eatdrinkpaleo.com.au”? You had me at salted caramel! Your cheesecake looks absolutely delicious! They look soft and moist. So delicious! Definitely need to try this! Love that no flour is in there. Few alternations and this could be low carb. I was wondering about this. What is the requirement to be considered “low carb” or keto? Doesn’t anything just have to fit within one’s own carb limits for the day? So anything would be as long as you had little enough of it, right? 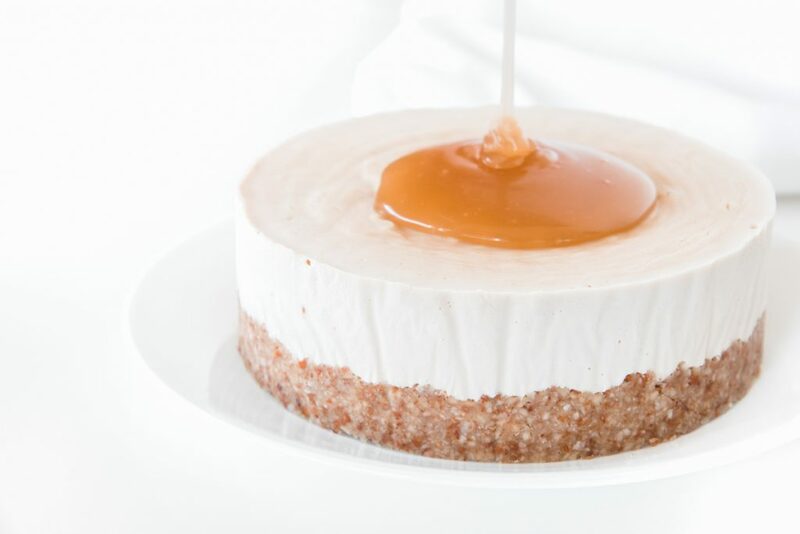 This cheesecake looks beyond decadent and I can’t say no to salted caramel! This looks delicious! I’m going to give this a try real soon. This looks awesome! I love that caramel action shot in the video. yum! Gah! THis sounds and looks amaaaaazing. Thanks for sharing!!! Gah! Get it in you! Drooling! This truly looks amazing. I honestly like cashew cheesecake better than the real one! I can see that. They are the bomb!